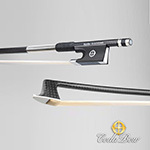 The Coda Prodigy cello bow is precision-engineered to provide professional characteristics at a pre-professional price. The Coda Prodigy cello bow's dynamically balance shaft offers off-string agility commonly reserved for high-performance bows while also providing on-string forgiveness and comfort desired by young players.The Coda Prodigy cello bow has a round carbon graphite stick with Kevlar core, fully lined nickel mounted Xebony frog, three-part adjuster, silver winding and leather grip. 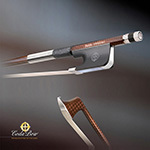 Made in U.S.A.
คันชักดับเบิลเบส Coda Bow Revelation Woven shaft embodies the precision and craftsmanship that is inherent in all CodaBow designs. Using an innovative process, CodaBow meticulously controls uniformity, taking special care to preserve fiber orientation along the entire shaft and well into the head. The REVELATION?s eye-catching evenness and balance from frog through tip is readily apparent also to the ear and hand. Woven architecture controls bow performance in all directions. 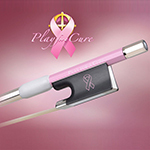 This design offers stability laterally while also providing lively response down the shaft, thus giving quick string initiation and full even sound. A stunning technological tribute to history’s fine bows, the DIAMOND SX offers premium performance for professionals. 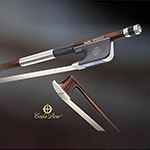 Sophisticated and reliable, the SX is the ideal ‘touring’ bow for every professional musician and teacher. Never leave home without your Passport. The SX shares the DIAMOND Collection’s trademark Graphite Diamond Weave architecture extending precisely from button to tip plate. This eye-catching technology tailors shaft characteristics in two axes giving the bow strength for power and flexibility for nuance. The SX also features CodaBow’s revolutionary Kevlar Acoustic Core, imbuing the SX with a natural sensitivity and organic tone. 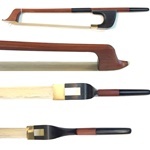 European styling and fittings are timeless and elegant celebrations of bow making’s revered traditions. Players applaud the natural feel and unrivalled durability of the Xebony TM frog. It’s rich luster and close grain are reminders of the heirloom ebony that once existed. The SX also features CodaBow revolutionary Kevlar Acoustic Core, imbuing the SX with a natural sensitivity and organic tone. A stunning technological tribute to history fine bows the DIAMOND SX offers premium performance for professionals. 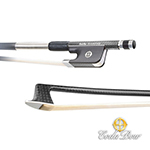 Sophisticated and reliable the SX is the ideal touring bow for every professional musician and teacher. Never leave home without your Passport. 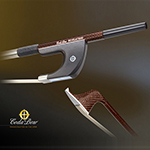 The SX also features Coda Bow’s revolutionary Kevlar Acoustic Core imbuing the SX with a natural sensitivity and organic tone.